If it’s moving time, you’ll want to find a packing system that helps to eliminate some of the stress and mayhem for you. Set up four containers: Keep, Donate, Sell, and Store. And of course have big trash and recycling bins on hand too. Don’t use clear bags for the trash – once you throw something away, you don’t want to see it again and be tempted to rescue it from the garbage. Ensure every item you touch gets assigned to one of those containers. Put the current date on the storage boxes and revisit them in six months. If you haven’t needed the items within that time, separate them again as per the above system. Create a moving “toolbox” to keep packing supplies together. Your kit should include permanent markers for labeling boxes, packing tape, duct tape, string, a box cutter, a measuring tape, screwdrivers, a hammer, color labels or tape, garbage bags, small Ziploc baggies and a pencil and pad of paper for notes and reminders as you pack and unpack. When taking apart furniture and electronics, place screws, Allen keys, cords, etc. packingin small Ziploc bags, then tape the bags directly to the items. Clearly identify where every box is to be delivered. Remember, “Tyler’s room” means nothing to the movers. Instead, assign a different color to each room in your new home and place the assigned color label on the door. 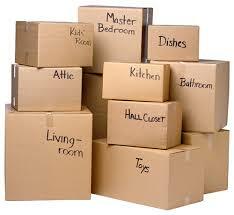 Then, when packing, place the corresponding color label or tape on the moving boxes that are to be delivered to that room. Remember that not everything needs to be boxed up – some things are already ready to move. For example, if your clothes drawers are already purged and organized, there’s no need to unpack them for the move. Instead, stretch clear plastic wrap over the top of the filled drawers and move your clothes using the drawers as your moving boxes! If you have suitcases at home, put them to work by filling them up with shoes or other bulky items, and roll them to your new place. Have one FINAL box that is LAST in, FIRST out. Cover it with red tape or something else to make it really stand out. This is where you put your phone chargers, screwdriver, hammer, a roll of toilet paper, snacks, diapers and wipes, bandaids, and anything you’ll need immediately at the new house and can’t waste time digging around for. This is the box of essentials you will need immediately – and put it in your car, not the moving van if possible!